The Occupy London Stock Exchange camp is now 59 days old - the same age as the Occupy Wall Street camp in Zuccotti Park was when it was taken down. The survival of the camp outside St Paul's Cathedral owes something to the Americans in the UK who have been among its keenest supporters. Visitors pose for pictures as if it was a tourist attraction. Workers in sharp suits walk quickly past, and others simply point in surprise - it is not every day you see 200 tents pitched outside one of the capital's main landmarks. The camp is closely modelled on Occupy Wall Street. Though it began a month later, it is still going almost a month after its New York counterpart was dismantled with violent exchanges between police and protesters. "There is a great deal of solidarity with camps within the movement in New York and Oakland and other places," says Anthony, a New Yorker who now lives in London. He has been involved in Occupy London since the beginning, helping in a number of ways, including keeping watch at night. "Attacks on Occupy in the US have been absolutely dreadful." A protest took place outside the US embassy the day Zuccotti Park camp was removed, which Anthony attended with a handful of other Americans. While that was happening, Ryan H, who lived in a tent at St Paul's for the first few weeks of the camp's existence, flew home to New York with two friends - one American and one British. "We felt like we had to go help out," he says. "I was really sad and really, really angry when I saw it happen." The anger felt by other London occupiers was expressed in a banner calling for New York Mayor Michael Bloomberg to resign that hangs between two trees at a second camp in Finsbury Square, which opened on 22 October to ease crowding at the cathedral. "We are a worldwide movement," says Adam Fitzmaurice, another of the 200,000 Americans living in the UK, who helped organise a precursor to the Occupy Wall Street movement last summer, known as Bloombergville. On returning to London in the autumn, he helped plan Occupy London, and camped at the St Paul's and Finsbury Square sites. Liberals outside the US have long taken a dim view of America's influence in the world, particularly since the wars in Afghanistan and Iraq. But Anthony believes "the Occupy movement in the US has humanised Americans" for many foreigners. Similarly, George Por, 67, a Hungarian-American in London says Occupy Wall Street "has made me proud again of being American". "In the 60's, I was an organiser of the student movement in Hungary. Since then, I've never stopped yearning for a time of large-scale awakening to the need for social, economic, and political justice," he says. Numerous Americans I spoke to in London expressed a similar sense of optimism and a similar feeling that perceptions of America are changing, thanks first to the election of Barack Obama and then the Occupy movement. 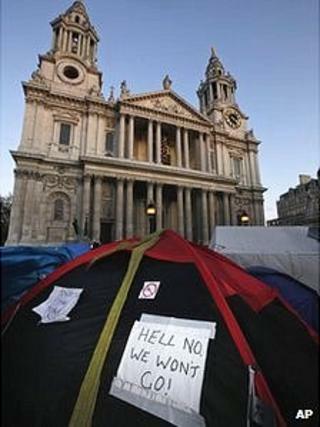 Among those taking part in Occupy London is someone who once occupied Wall Street himself - as a high-flying executive. A top financial service analyst in New York during the 1980s, Rodney Schwartz worked for Merrill Lynch and Lehman Brothers, moving to the UK in 1987 to become head of equities for Lehman Brothers in Europe. "I hated it," Schwartz says bluntly. So he left and set up a company that helps charities raise money through investment. Schwartz, 54, has given a talk at Occupy in Finsbury Square about this "social enterprise business model". As someone who understands the financial sector from the inside, he also wants to enlighten occupiers about what went wrong economically in the last few years. Ruth, from Connecticut, who has been in the UK for about 40 years, helps organise talks at Tent City University - the St Paul's sanctuary that houses the camp's library. "The US… has been a real inspiration to us here," she says. She took part in a number of meetings to decide how to respond to the Corporation of London's threats to evict the occupiers - including its attempt to agree a date on which the occupiers would leave voluntarily. "When we came together to discuss whether we would accept the deal with the Corporation of London, people were saying, 'Look what they faced in Oakland,'" she says, referring to the California camp, which was eventually taken out on 14 November. "They faced tear gas and rubber bullets - are we going to just go because they say so? Are we going to roll over? "We thought, 'We can't let down the other Occupies in other places. We have to stand firm like they did in the US.'" Sean Ganley, who grew up on US Air Force bases in the US and the UK and elsewhere, sees Occupy as a form of "solidarity with all of the freedom movements", including those of the Arab Spring. "We view them as components of the same thing," he says. He has worked at all three London sites - St Paul's, Finsbury Square, and an empty building owned by the Swiss bank UBS, which has been occupied and christened the Bank of Ideas. He and other technically-minded protesters have helped set up live-stream video conversations with protesters in Syria and elsewhere, including the Occupy movements in the US. When protests in Egypt's Tahrir Square erupted once more just prior to elections in November, people at St Paul's wrote notes of support, which were then mailed to a point person in Cairo. "The more they try to destroy the movement there and really anywhere," Mr Ganley says, "the more the movement and the public come back fighting."